I was raised in Uniontown, AL and I am the oldest of seven children. I received my elementary and secondary education from the Perry County School System. I currently serve the youth of Marion as a Special Education Teacher in grades fourth-sixth at Albert Turner Sr. Elementary School. After receiving my Bachelor’s of Science degree in Collaborative Teacher Education (K-12) from the University of Alabama, I moved to Augusta, GA and began my teaching career. I taught in Georgia for three years before moving back to my home town, Uniontown, AL, to teach in my present position. I currently hold a Masters degree in Special Education (K-12). 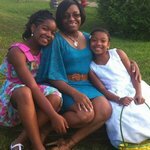 I am encouraged and thankful everyday for my beautiful and mischievous daughters, Jordan (13) and Tamya (9) Evans. I am blessed to serve ALL of the children of Albert Turner Sr. Elementary School.